Roof shingles are a roof covering consisting of individual overlapping elements. These elements are normally flat rectangular shapes that are laid in rows without the side edges overlapping, a single layer is used to ensure a water-resistant result. 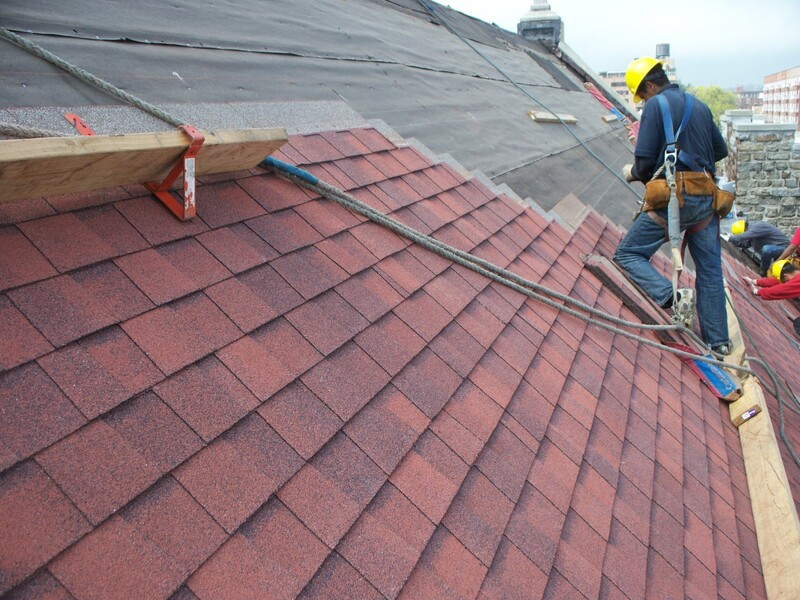 Shingles are laid from the bottom edge of the roof up, with the bottom edge of each row overlapping the previous row by about one third its length. Historically, at the roof ridge there was a cap consisting of copper or lead sheeting which in modern times has been substituted by shingles with a plastic underlay. Shingles have been made of various materials such as wood shingle, slate shingle, bitumen-soaked paper covered with aggregate (asphalt shingle) or ceramic. Due to increased fire hazard, wood shingles and paper-based asphalt shingles have become less common than fiberglass-based asphalt shingles. In the United States, fiberglass-based asphalt shingles are by far the most common roofing material used for residential roofing applications.